Am in a bit of a hurry today so just a whizzing by post. A whizzing by comment, then: incredible! Going to wear out the tyres, then? Hi, whizzing in for a visit, and enjoying your unique viewpoint on London. 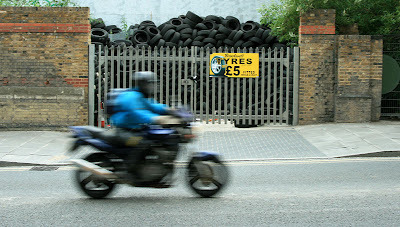 And loads of tyres in store to support continuous whizzing! Well, of course you're in a hurry - it's Monday!